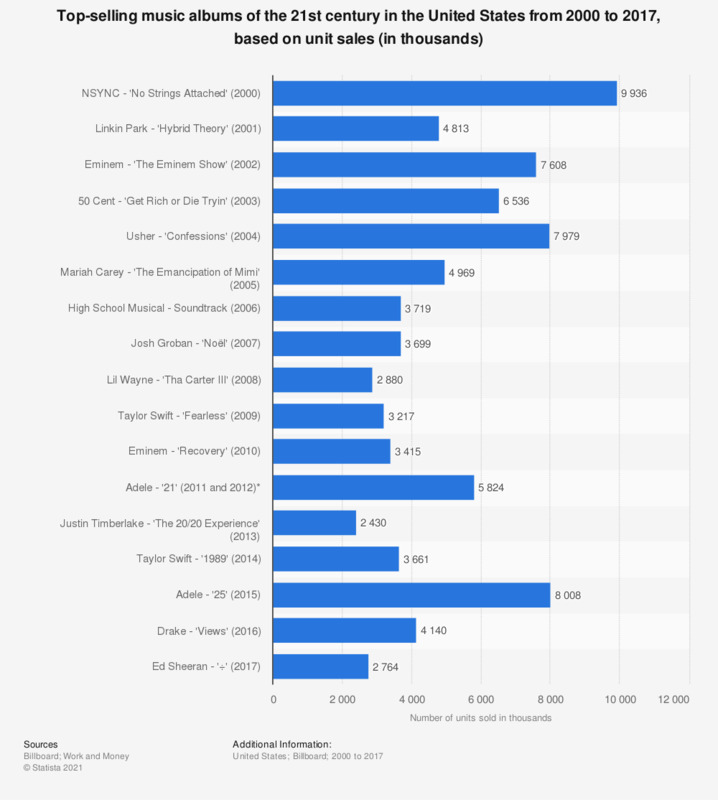 This statistic presents the best-selling albums of the 21st century in the United States from 2000 to 2017. Taylor Swift had the highest selling album in the United States three times since the 21st century began, and her album '1989' sold over 3.6 million copies in the year of its release in 2014. Singer Adele features twice, with '21' remaining the top-selling album in the United States for two years consecutively, and in 2017 Ed Sheeran had the best-selling album in the U.S. with 'Divide', selling almost 2.8 million copies of the album that year. *As of early January 2019, '21' by Adele had featured in the Billboard 200 list for a total of 395 weeks, and was the top-selling album in the United States for two consecutive years.